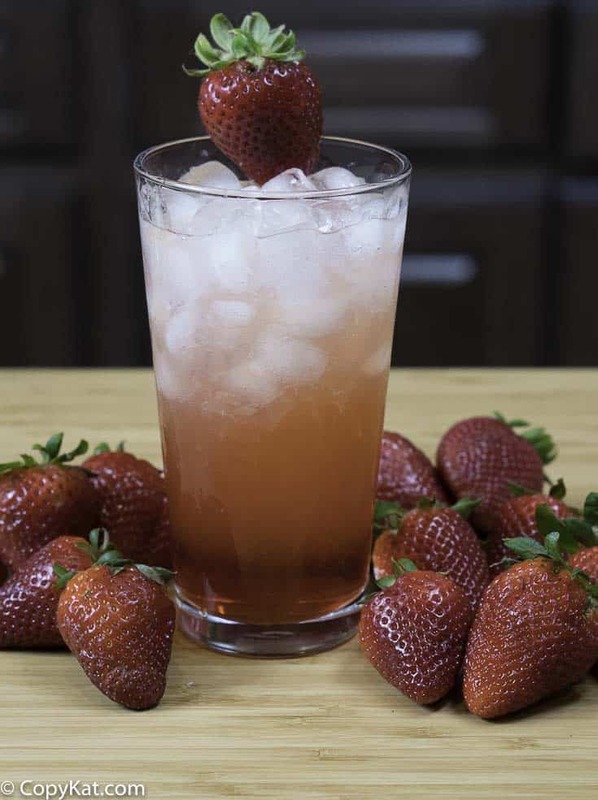 Sonic Strawberry Lemonade is a favorite drink of so many people, guess what, you can make this sonic drink recipe at home, and it isn’t hard to do at all. Did you know that Sonic has over 168,00 drink combinations? Sonic has so many flavors of sodas, slushes, flavor add-ins and more. So you could literally go to Sonic every day once a day for over 400 years and still have not tried each one of these drinks. Pretty amazing, isn’t it? I personally love homemade lemonade. What can make a lemonade better? Strawberry syrup. I can show you how to make a delicious strawberry syrup with real fresh strawberries. Homemade strawberry syrup has no artificial colors. If you don’t want to use sugar, you could experiment with another type of sweetener. My fresh strawberry syrup is made very simply. Strawberries are washed, hulled, quartered, and then simmered in hot water. The solids are removed from the beautifully flavored water. The strawberry infused water is then sweetened with sugar. Be sure to store the strawberry syrup in the refrigerator, it will last for about 10 days. 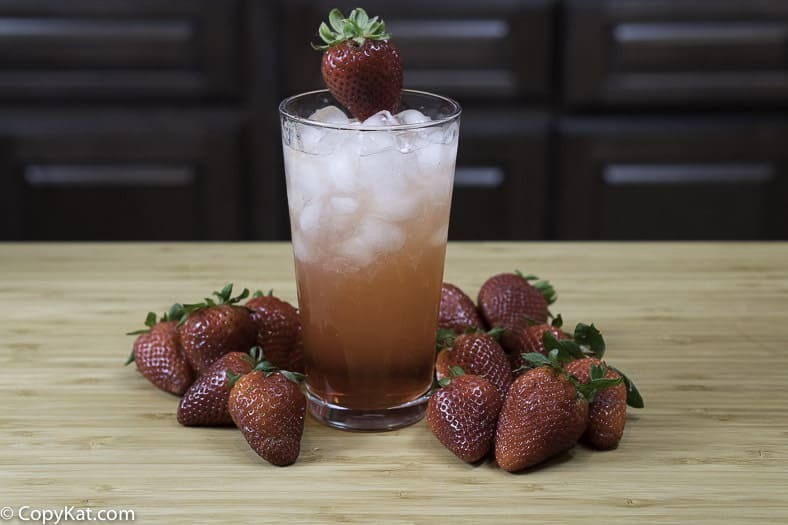 Your strawberry syrup can be used to make a Sonic Strawberry Limeade, or even used to spruce up a Mimosa, or simply added into Champagne. As you can see it’s really easy to make a wonderfully flavored strawberry syrup with natural ingredients, and the possibilities are unlimited. I hope you enjoy this Sonic Strawberry Lemonade. Love Sonic Recipes? Check out these Sonic favorites. You can make Sonic Strawberry Lemonade at home with this easy copycat recipe. To make strawberry syrup wash and hull your strawberries. Cut strawberries into quarters. Place strawberries into a pot and add 32 ounces of water. Bring to a boil, then simmer for 15 minutes. Strain liquid, discard the strawberries. Add sugar, and cook for 5 additional minutes. Skim off any impurities on the top of the syrup. Pour into a container, and allow to cool. Store the syrup in the refrigerator for up to two weeks.To make an individual drink, fill a large glass with ice, add 1/4 cup strawberry syrup, and then 1 cup of your favorite lemonade. Stir to combine. Garnish with strawberries if desired. My son tried it yesterday! It was yumm we all loved it! Wow! such a great combination of strawberry and lemonade! I love love love sweet fresh strawberries in the summer time. Especially when they are in a lemonade. I don’t have a Sonic near me, but no reason to not give this one a go!